TORONTO, Sept. 7, 2012 /CNW/ - Royal Bank of Canada (RY on TSX and NYSE) and Shoppers Drug Mart Corporation (SC on TSX) today introduced the new co-branded RBC Shoppers Optimum MasterCard. In conjunction with the launch, RBC announced its intention to acquire the existing Shoppers Optimum MasterCard credit card portfolio. "This is a natural extension of the strategic alliance between RBC and Shoppers Drug Mart," said Dave McKay, group head, Canadian Banking, RBC. "Our joint program is designed to deliver financial flexibility while giving Canadians access to one of the top loyalty programs in the country. This is another step forward in making banking easier and the retail experience more rewarding for everyone." The RBC Shoppers Optimum MasterCard is a no-annual fee credit card with increased Shoppers Optimum Points earning potential. The credit card features state-of-the-art chip and PIN security, extended warranty and purchase security insurance. The RBC Shoppers Optimum MasterCard program is the latest co-branded financial services product offered by two of Canada's leading brands and complements the RBC Shoppers Optimum banking account and debit card. SinceMarch 2012, Canadians with this account have been able to earn more Shoppers Optimum points by paying with their debit card and have gained access to Canada's largest network of ATMs across the country, including more than 250 ATMs in Shoppers Drug Mart and Pharmaprix stores and an additional 50 ATMs to be installed by year-end. "We are continuously looking for new ways to reward our Shoppers Optimum members and are pleased to provide this enhanced financial service offering with RBC, a trusted leader in banking," said Domenic Pilla, president and CEO, Shoppers Drug Mart. "Our Shoppers Optimum loyalty program members are among our most passionate customers, and with the launch of this new credit card they will have more options for earning rewards." · Earn more rewards points even faster: Canadians can earn Shoppers Optimum points whether they shop at a Shoppers Drug Mart/Pharmaprix location or at any merchant that accepts MasterCard or Interac debit. · Bonus points: Collect extra points for signing up. Earn additional points on purchases when presenting the Shoppers Optimum loyalty card at Shoppers Drug Mart/Pharmaprix. Financial terms of the proposed acquisition of the existing Shoppers Optimum MasterCard credit card portfolio by RBC were not disclosed. The proposed transaction, expected to close later this fall, is subject to customary regulatory approvals and other conditions. 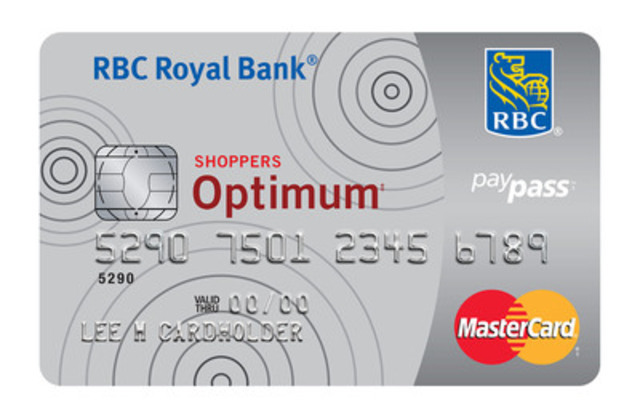 Upon completion, RBC expects to roll the existing Shoppers Optimum MasterCard credit cards into the RBC Shoppers Optimum MasterCard credit card program. In the meantime, existing cardholders can continue to use their Shoppers Optimum MasterCard and receive the same benefits that they do today. Royal Bank of Canada (RY on TSX and NYSE) and its subsidiaries operate under the master brand name RBC. We are Canada's largest bank as measured by assets and market capitalization, and are among the largest banks in the world, based on market capitalization. We are one of North America's leading diversified financial services companies, and provide personal and commercial banking, wealth management services, insurance, corporate and investment banking and investor services on a global basis. We employ approximately 80,000 full- and part-time employees who serve more than 15 million personal, business, public sector and institutional clients through offices in Canada, the U.S. and 51 other countries. For more information, please visit rbc.com. Shoppers Drug Mart Corporation is one of the most recognized and trusted names in Canadian retailing. The Company is the licensor of full-service retail drug stores operating under the name Shoppers Drug Mart (Pharmaprix in Québec). With more than 1,215 Shoppers Drug Mart and Pharmaprix stores operating in prime locations in each province and two territories, the Company is one of the most convenient retailers in Canada. The Company also licenses or owns 56 medical clinic pharmacies operating under the name Shoppers Simply Pharmacy (Pharmaprix Simplement Santé in Québec) and six luxury beauty destinations operating as Murale. As well, the Company owns and operates 63 Shoppers Home Health Care stores, making it the largest Canadian retailer of home health care products and services. In addition to its retail store network, the Company owns Shoppers Drug Mart Specialty Health Network Inc., a provider of specialty drug distribution, pharmacy and comprehensive patient support services, and MediSystem Technologies Inc., a provider of pharmaceutical products and services to long-term care facilities.